Heartiest Congratulations to Archana Murthy on winning the 2nd position in the National Declamation Contest organised by National Foundation for Corporate Governance along with SIMS. The competition was conducted in two phases: the first required us to submit a 1500-word paper on Corporate Governance: Developing Leaders from Within and received entries pan India. For the second and final round, the top ten papers were selected seeing participation from JNTU Telangana, Welingkar Bangalore, TISS Mumbai, SIIB, SCMS Cochin, LIBA Chennai and SIMS. Each participant was required to present their paper in front of a panel of judges and the top three were selected out of these. Sarthak Mehrotra and Sasanka Sekhar Gouda secured 3rd position in "Pratikroza 2.0" of IIM Bodh Gaya. 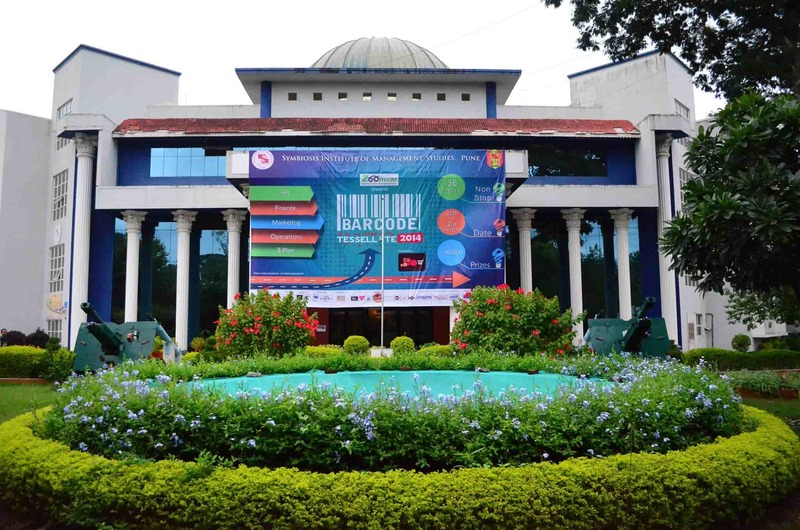 "Sarthak Mehrotra and Sasanka Sekhar Gouda secured 3rd position in "Pratikroza 2.0" of IIM Bodh Gaya." Heartiest Congratulations Amit Ranjan Thakur, Ashish Kumar Singh and Dhirender Singh on securing the First Position and being awarded with the cash prize of INR 11,000/- along with certificate and trophy in the annual fest 'ADHIKOSH' of National Institute of Bank Management (NIBM), Pune competition ‘Let's Built a Bank’. 32 students along with Myself, Dr. Archana, Ms. Sanchari visited NSE and the Bloomberg office at Mumbai. Students visited the Bloomberg office on 27 February, 2019 where they attended a workshop to understand the various functions present in the Bloomberg terminal. 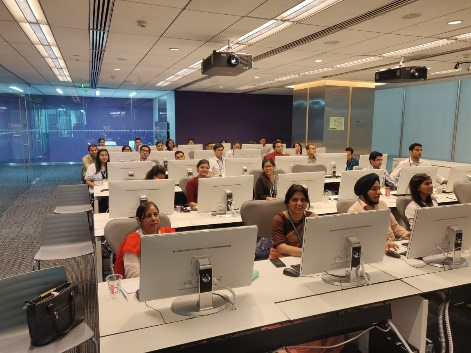 The students of SIMS were given extensive training on fundamental analysis of a company using various parameters and terminal functions along with an overview of foreign exchange analysis. The students learnt as to how the buy side and sell side of mutual fund look for the information from Bloomberg and how do they make the decision. The students were also shown as to how to get the analyst report of a particular stock as how does this help in the decision making process. The session was conducted by Mr. Jay Janardhanan who is an Analyst at Bloomberg. The students were also given an overview of the economy by Mr. Abhishek Gupta, economist at Bloomberg. He also explained how students could access various reports on the terminal by doing economic research, inflation, GDP etc.. It was an enriching experience for students who learned many functions and data extraction from Bloomberg terminals. Overall the students found the trip to be fruitful and gained valuable insights. 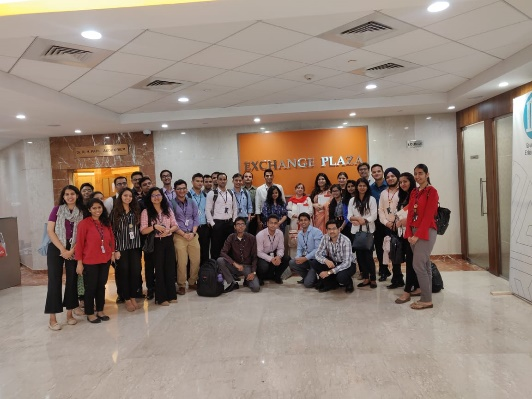 32 students along with Myself, Dr. Archana, Ms. Sanchari visited NSE and the Bloomberg office at Mumbai. At NSE Mr. Purv Shah conducted a session for the students and he explained the basic concepts of functioning capital market. He also showed live trading along with how a trade is entered into system and gets executed. Mr. Shah also explained concept of derivatives using the analogy of "Advance booking of movie" and this helped the students in grasping the concept quickly and in a better way. Students from various colleges were also present for the session at NSE. The students were able to get a glimpse of NSE and relate to what they had been taught in class. 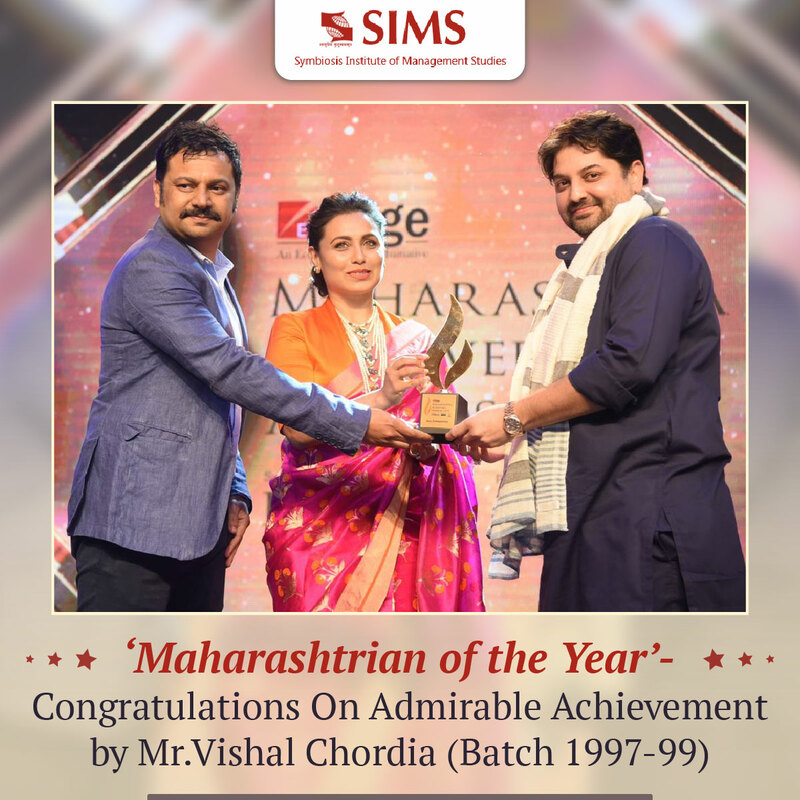 SIMS alumnus Mr.Vishal Chordia (Batch 1997-99) has been awarded ‘Maharashtrian of the Year’ in Best Entrepreneur Category by Economic Times. 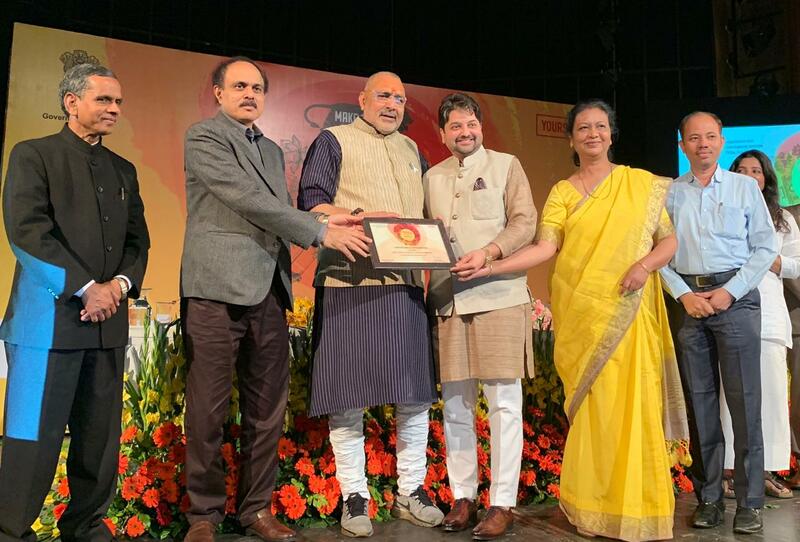 SIMS alumnus Mr. Vishal Chordia (Batch 1997-99), chairman MSKVIB, receiving National Award on behalf of Maha Khadi by Govt. of India. He recieved the winner's award in the Best Brand Transformation, at the hands of Shri Giriraj ji SIngh, Minister of MSME, along with Secretary MSME and DC Govt. of India. 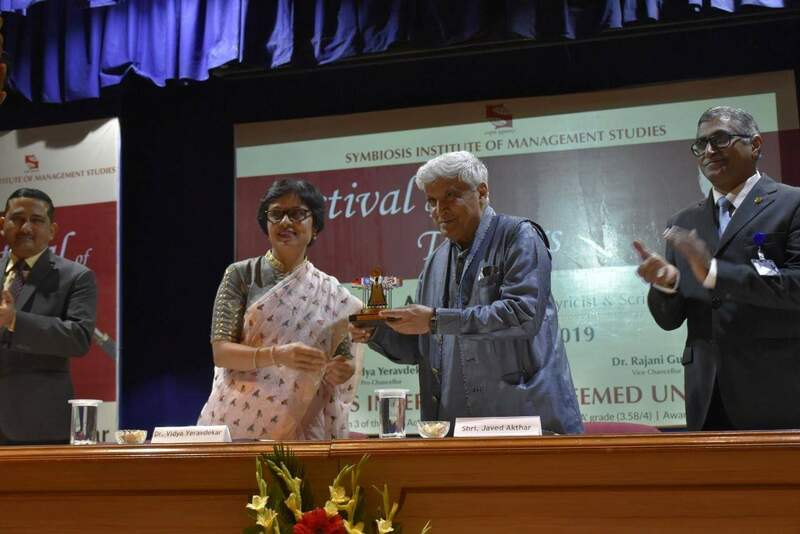 On the occasion of Festivals of Thinkers, Shri Javed Akhtar enlightened the students with his valuable thoughts in the presence of Dr. Vidya Yeravdekar on 23rd January 2018. Heartiest Congratulations Tarun on clearing the UGC NET Exam for Assistant Professor. Mr. Vishal Chordia, an Alumnus of SIMS received the Nav Bharat Times award for Corporate Excellence at the hands of Hon. Chief Minister Shri. Devendra Phadnavis in Mumbai on 14 Dec. The SIMS Men's Cricket Team took part in the SIU Cricket Tournament from 20th to 27th November, 2018. The team started right from the bottom (Round 1) and beat top teams like SSLA, SCMS, SIBM Pune and the organizers SIT, with some truly well earned victories, to reach the final. Placement Cell organized its Flagship Event, Global Leaders' Summit on 12th October 2018 at the campus. This event saw eminent industry honchos from various corporate houses, reaching out to the young minds of the students and impart knowledge through years of expertise in their respective fields. The entire event had broadly five prominent panels with the topics that are currently trending and relevant for the batch. Consulting - Is your hiring process as emotionally intelligent as the people its meant to hire? IT/ITES - Are we winning the Cyber Security War? The feedback from the Global Leaders was extremely heart warming and they were thoroughly impressed by the meticulous planning. They complimented Mrs. Renuu Kulkarni, Head Placements and Corporate Relations and the Placement Team for the flawless execution of the event which required detailed planning and commitment. The event was termed mind blowing by the leaders' who participated in the event and contributed to its success. The host for the event was Mr. Manish Tyagi, a former Naval Commander turned Standup comedian. His presence created an amazing atmosphere and adding humor to the event which the Leaders' thoroughly enjoyed. He gave the much-required laughter element in between the serious discussions. The students garnered maximum knowledge from the panel discussions and the session was very informative and the students participated with much enthusiasm as they were directly able to ask their doubts to the Global Leaders and get a perspective which classroom learning may not be able to provide. The session was able to engage the students and incite their inputs as well which made the discussion more inclusive. National Alumni Meet 2018 – Luminaire held on the 6th of October was a memorable event filled with colourful décor, beautiful performances, lip smacking food and lots of laughter, nostalgia & love. The day kicked off early, with both basketball and football matches played with a vigour that can be showcased only by SIMsites. The rest of the day was filled with music, dance, food and beautiful backdrops to take pictures to cherish. SUR got everyone to stop in their tracks and listen to their brilliant outdoor performance under MGH. The flash mob performance by Vibes in front of MGH was enjoyed by a huge audience with cheers and claps throughout the rendition. NAM's first edition of SIMS Social which was a speed networking event was held under the dome and witnessed an ever greater level of student-alumni interaction, with questions ranging from the topics of life in SIMS, placements, transition from college to corporate life and much more! The panel consisted of some of our illustrious alumni namely, Akshay Mehrotra (Batch of 2004), Yayati Zende (Batch of 2006) and Aseem Goel (Batch of 1997) who were more than open to questions from student managers. The cultural evening was nothing short of extravagant. The Award function recognized the achievements of some of our most successful alumni from the 1998 batch. From scintillating sounds of the Sur team, to Aks' outlandish performances, and to Vibes enthusiastic and uplifting dance performance- the cultural clubs of SIMS gave it their all- and the alumni were more than willing to (re)participate! The evening culminated in a thrilling performance by Yayati Zende Sir and Chetan Sindhwani Sir who also played a song with Sur. And finally, this was followed by High-tea under the dome which was filled with an array of delicious food and alumni reminiscing their old memories with their fellow batch mates & faculty and sharing some of their experiences with the student council. As the meet drew closer to an end, there was nostalgia in the air, and a promise to meet again soon. Power BI is a collection of software services, apps and connectors that work together to turn the unrelated sources of data into coherent, visually immersive and interactive insights. It provides interactive visualizations with self-service business intelligence capabilities, where end users can create reports and dashboards by themselves, without having depend on information technology staff or database administrators. With the intention of empowering our student managers with this tool, IT Cell invited Mr. Hemant Thakar, CEO of Educationbelt on September 8, 2018 to conduct a workshop on Power BI. The workshop unfolded with introduction to BI, followed by understanding the software interface. Data, relationship and visualization bar and application of those in databases. Relationship management of fact and dimension table was covered. The workshop concluded with making of personalized dashboards and publishing them to web. We hope that the student managers got great insights on the topic and got the opportunity to explore the world of data analytics with Power BI. Sreerag Vinod & Akhil Satheesh on having secured 1st position in Agency the flagship event of, a Media Agency Simulation Competition conducted as part of NMIMS managerial fest Nityaksh 2018. Congratulations Hassan on being chosen for the ‘ Dr. S.B. Mujumdar award for the Most Outstanding Foreign Student of the Year’. Shilpi Kaushik, Dr Arti and Dr Mita’s research paper has been declared the Best Paper of the Session in SIMC conference. Two teams from SIMS won the 1st and 3rd position in HR-istic - an HR Case study competition conducted as part of NMIMS, Banglore managerial fest Nityaksh 2018 on 29th September 2018. Heartiest congratulations for Two teams from SIMS who won the 1st and 3rd position in HR-istic - an HR Case study competition conducted as part of NMIMS, Banglore managerial fest Nityaksh 2018 on 29th September 2018. Nupur Pradhan,Pranay Bhagat & Vipula Singh secured the 1st position and were awarded with cash prize of Rs 10000/- and certificate of merit. Meghna Shokeen,Sahil Arora & Sharon Josheph secured the 3rd position and were awarded with cash prize of Rs 5000/- and certificate of merit. This is unique that two teams from any institute win top 2 positions amongst tough competition from other top B School teams. It is truly indicative of the talent in SIMS. Well done. Nupur Pradhan,Pranay Bhagat & Vipula Singh secured the 1st position and were awarded with cash prize of Rs 10000/- and certificate of merit. Meghna Shokeen,Sahil Arora & Sharon Josheph secured the 3rd position and were awarded with cash prize of Rs 5000/- and certificate of merit. Writeup: The visit to the Bharti hospital was conducted by Yoddhas club on 20th September 2018. The team reached the hospital at around 10:00 am in the morning. The hospital was celebrating cancer and rose day on that day. We started the event by giving introduction about Yoddhas. Followed by the introduction, we distributed handmade greeting cards to kids suffering from Cancer. These cards were made by SIMS students at the greeting card competition- Aashayein. The team danced with joy with the children. In spite of having such a deadly disease, they danced with us forgetting all of their problems. This was followed by do’s and don’ts session by the team. The team also taught them the importance of yoga and conveyed that yoga should be done daily. The information of the children and their parents who were interested in Yoddhas was recorded. The event ended with gift distribution to children. The kids enjoyed to the fullest and the joy could be seen and felt in the atmosphere. The event was a success and the efforts of Yoddhas team were appreciated by the hospital. Mr. Dinesh Munot, Director, Eskay Engichem Pvt. Ltd.
Mr. Satish Pathak, Founder and Executive Director, Samiep Technologies Innovation Pvt. Ltd.
NOESIS - The Operations Club of SIMS conducted Vichaar Manthan -The Panel Discussion on 22nd September’18. The topic of panel discussion was “Green Supply Chain- Opportunities and Challenges”. Mr. Milind Patil was the moderator for the panel discussion. The event was attended by first year students and second year students (Operations Major and Minor). The panel discussion was very informative and all the students gained a lot of insights on green supply chain from the discussion. The event went smoothly which included an exchange of various ideas based on different topics related to Green Supply Chain. The event ended by a Q & A among panel members and students. Khandaker Ruhul Amin, Avinash Singh and Pankaj Yadav from MBA Batch 2017-19, stood 2nd and won 5,000/- cash prize in "Ressurection- The second chance" competition organised by SIIB, Pune. Khandaker Ruhul Amin, Avinash Singh and Pankaj Yadav from MBA Batch 2017-19, stood 2nd and won ? 5,000/- cash prize in "Ressurection- The second chance" competition organised by SIIB, Pune on 21st September 2018. This competition was a part of their national level marketing competition Markadiction 2018. Shardul Ghatpande and Shashank Shankar's (MBA batch 2017-19) article titled "US-China Trade War: Its Impact on the Indian export market" has been ranked fourth best article in "ChakraVyuh 1.0"
Heartiest Congratulations Shardul Ghatpande and Shashank Shankar MBA batch 2017-19. Their article titled "US-China Trade War: Its Impact on the Indian export market" has been ranked fourth best article in "ChakraVyuh 1.0" organized by Delhi School of Economics. Shubham Chauhan and Akhil Satheesh on securing 1st position in Serie Strategem, an Operations Case competition conducted as part of NMIMS, Banglore managerial fest Nityaks. Congratulating Shubham Chauhan and Akhil Satheesh on securing 1st position in Serie Strategem, an Operations Case competition conducted as part of NMIMS, Banglore managerial fest Nityaks. This is indeed very good news, SIMS compliment and commend you both on this creditable achievement. Well done. SIMS is proud of you. A study visit to Bloomberg was organised by the Bloomberg club on 11th September 2018. The students visited the Bloomberg lab along with Prof. Rahul Dhaigude and Dr Vaishali Jain. There were students from batch 2017-19, 2018-20 and PGADM. The students were given training on various functions of Bloomberg and this training was given by Mr. Saurav Prakash, Bloomberg. They were also exposed to the commonly used functions in Bloomberg by portfolio managers, and research analysts. It also covered various corporate governance reports along with fixed income securities. The trainer also covered intra-day trade data and how this data can be extracted from Bloomberg Data to make decisions. The most commonly used function EQS, Equity Screener was also dealt and explained to the students along with work flow analysis. Overall this was an interesting and interactive session which helped the students to gain the insight into functionalities of Bloomberg terminals. The students also learned the various ways in which the data can be extracted and used to make various research reports. Heartiest Congratulations Arti Jha on winning the 1st Position in "KRITANSH- BEST MANAGER Event" organised by SIIB under AGRI-SUMMIT 2018 along with a cash prize of Rs. 20,000/-. 4Thought, a panel discussion was arranged by SMark, the Marketing club of SIMS. Infinite Club organised a panel discussion on “The Role of Artificial Intelligence and Machine Learning in service sector”. SIMS team comprising of Arti Singh,Tanushree Khattri and Tanya Sharma secured 1st position among 75 top B school teams in Mindspark 2018 organized by SIBM, Pune. SIMS team comprising of Arti Singh,Tanushree Khattri and Tanya Sharma secured 1st position among 75 top B school teams in Mindspark 2018 organized by SIBM, Pune. They were awarded a cash prize of Rs15000 and certificate of achievement. Journal indexed on i-scholar and j-gate. Hyderabad Corporate Luncheon on Saturday, 7th July 2018. 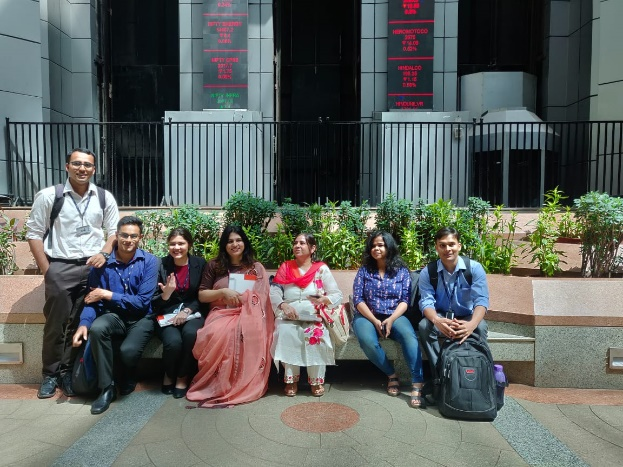 The People Tree – HR Club celebrated Teachers’ Day. The theme of the event was Comic Con. The teachers were allotted superhero and supervillain roles. research paper titled "A COMPARATIVE STUDY OF BASIC AND DEARNESS ALLOWANCE ACROSS CUSTOMER SERVICE EXECUTIVES IN THE ORGANISED APPAREL RETAIL INDUSTRY IN INDIA" in International Journal of Management Research. Mr. Hassan Wasswa, an international student, launched a campaign Let's get them dressed summer campaign which ran for 27 days. Through this campaign, he donated the clothes which were over 150kgs to an NGO called Deep Griha society at Tadiwala road in Pune. This attracted the attention of SIU board where by it was also posted in the university's Facebook page, HINDUSTAN TIMES, PUNE FRIDAY, JUNE 01 2018 page number 4 published an article about the same . Shubhita Rakesh, Vishakha Raghav, Shreya Nanda, Nishi and Prof Smita Mehendale wrote research paper titled " E-word of mouth in tourism sector - A methodological and thematic review' which has been published in Asian Journal of Management. Ruddhika Ardey, Rithika S, Nikita Singh and Prof Smita Mehendale wrote a research paper titled "Impact of Green Marketing on Consumer Behaviour - A Methodical and Thematic Review" which has been published in Asian Journal of Management. Palak Bhandari, Nidhi Gopal and Prof Smita Mehendale wrote a research paper titled titled "Impact of Green Marketing on Companies - A Methodical and Thematic Review" which has been published in Asian Journal of Management. Pankaj Kadyan, Ranjan Kumar and Prof Smita Mehendale wrote a research paper titled "Customer Satisfaction through Service Quality- A Methodical and Thematic Review" which has been published in Asian Journal of Management. Rashika Chauhan, Damini Ohrie, Parul Rana and Prof Smita Mehendale wrote a research paper titled "On Line Customer Trust - A Methodical and Thematic Review" which has been published in Asian Journal of Management. Abhay Shukla, Anurag Shukla, Vivek Bhosale, John James and Prof Smita Mehendale wrote a research paper titled " Management of Customer Value - A Methodical and Thematic Review" in Asian Journal of Management. Pranay Bhagat along with Prof Kingshuk wrote a research paper titled ,VOICE OF INDIA: CUSTOMER OPINION ON INCREDIBLE INDIA, which has been published in the GE- INTERNATIONAL JOURNAL OF MANAGEMENT RESEARCH (GE-IJMR). Ms. Shilpi Kaushik, Aseem Mehta, Shashwata Srivatsava and Prof Smita Mehendale wrote a research paper titled " Factors Affecting Employee Satisfaction - A Methodical and Thematic Review" which has been published in Asian Journal of Management. Pratik Kulkarni, Niyati NA, Aniket Gawas and Prof Smita Mehendale wrote a research paper titled "The Role of Social Media Marketing In Customer Purchase Intent - A Methodical and Thematic Review" which has been published in Asian Journal of Management. Tanvi Malik, Sumit Yadav and Dr Naval Lawande wrote a research paper titled "A Study of Diversity of personality in a Team and its Effect on Team Performance" in International Journal of Advance Research, Ideas and Innovations in Technology'. Rhea Sharma (batch 2017-19) won 1st prize for article writing competition organized by "Social Responsibility Forum" NMIMS, Mumbai. Dr Arti, Dr Mita and Ms Rakshita Dubey wrote a chapter titled, “A Study to Analyze the Impact of the Sub-Prime Crisis on IPOs” . Dr Arti, Dr Mita and Ms Rakshita Dubey wrote a chapter titled, “A Study to Analyze the Impact of the Sub-Prime Crisis on IPOs” which has been published in the book Economic Growth in Latin America and the Impact of the Global Financial Crisis by IGI Global. A MARKET ANALYSIS OF THE KEY FACTORS RESPONSIBLE FOR THE EXPONENTIAL GROWTH OF ADVENTURE TOURISM OVER THE PAST FEW YEARS IN INDIA" which has been published in UGC approved - JAMR journal. Dr Arti Chandani has been awarded Microsoft Azure Research Award worth USD 2000 proposal titled, "Use of Data Science for Placement Assistance"
Dr Arti Chandani, Dr. Mita Mehta and Mr. Akhilesh Rathore received he third prize for best paper in SMS-NHRD national conference in Lucknow. Dr. Pravin Kumar has been empaneled as Non-Executive Independent Director by Institute of Director . Ms Renuu Kulkarni won the "100 Top Training & Development Minds" award at Talent Listing 2018 organized by World HRD Congress. Hassan Wasswa, Neil Thorat, Pranav Matkar and Karanjeet Chahal won Runners Up position in FAD 5 a side Football League, organised by D7 Films & Media. Merwyn D’Souza along with Prof. Kingshul Bhadury wrote a research paper titled “Localization of coupon industry: Dealing in local deals” which has published in the International Journal of Latest Engineering and Management Research (IJLEMR). Asha Tamminaina has been declared as one of the Best Intern at WIPRO. She has also got PPO from WIPRO. Nisha Saini wrote a research paper titled ‘ What makes a customer choose an OTA (Online Travel Agency)?- An insight into a traveler’s mind’ which has been published in in the International Journal of Innovative Research and Practices. 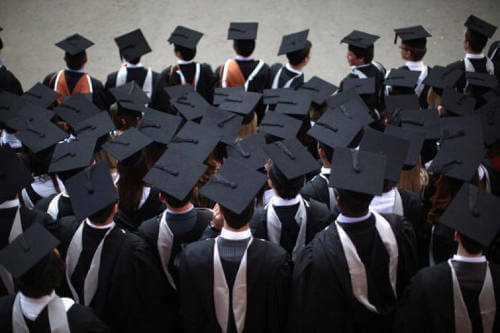 Pradnya Chitrao and Pravin Kumar Bhoyar wrote a research paper titled, ” Educating the New Generation Entrepreneurs: The Role of Alumni Entrepreneurs” which has been published as a paper in a Springer publication titled Entrepreneurship Education. Ms. Aakanksha Saxena, Mr. Anurag, Mr. Nishant Rai, Mr. Gaurav Rathore, Ms. Jaya Mayadas and Mr. Narendra Sharma have cleared CFA level 1. Mr. Arjun Sindhwani has cleared CFA level 2. Karthik Ramaseshan and K Raj secured 1st position in Finberg, a Bloomberg based case study competition conducted by SIIB. Col Sanjeev (Batch 2017-19) has been awarded “GOC-IN-C Southern Command COMMENDATION CARD” on Independence Day. Jasminejeet Kaur along with Dr. Pradyna Chirtrao wrote a research paper titled “Mentoring Programs: A Case Study of an Automative Company” which has been published in International Journal of Management, IT & Engineering (IJMIE). Dr. Hirak Dasgupta along with Nidhi Phutela wrote a research paper titled, “Companies perspective on Trust building Factors-:A Case of Online Tourism companies in India” which has been published in an edited book-Tourism Marketing:A Strategic Approach published by CRC Press, Taylor &Francis Group. Dr Suruchi has been elected Secretary of ISTD, Pune Chapter. SIMS has been ranked 3rd under the category “Top B-Schools by Sector” for its MBA Executive in the country by “CSR-GHRDC” B-Schools Survey 2017.